Syythe is more of an all-around practitioner of magic, whom is't really prone to either short range or long rage combat. As an Overlord, Syythe enjoys quite a few supernatural abilities. These include eternal youth, a natural affiliation for the forces of darkness (Which he is prone to taking advantage of if it will give him an upper hand), and dark magic. His ability set varies depending on what form he is in. Syythe prefers to stay in his human disguise as to not terrify those around him and garner an angry mob within seconds, besides he tends to hate his own appearance. 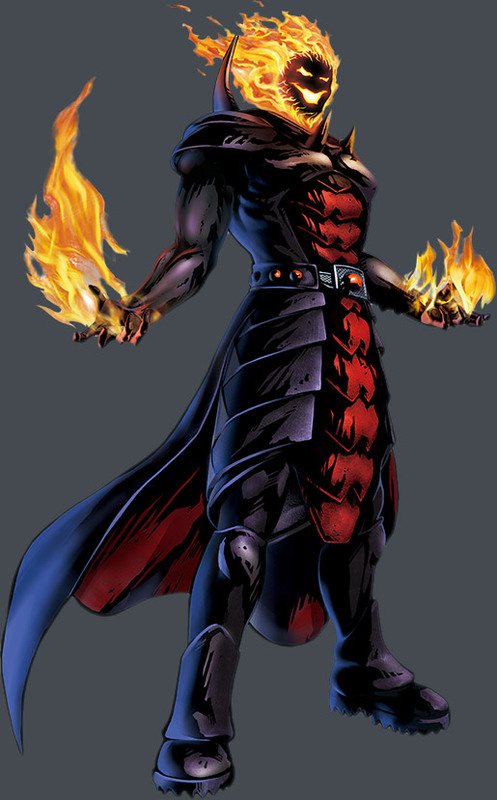 In his human form, he can use "Nero Flames" which surrounds his fists and sometimes his legs. He uses them for melee combat, unlike normal flames, Nero Flames leave burns that can only be healed using holy magic. He can also use the flames around his legs to thrust himself into the air and fly. For long-range he simply shoots the fire out at people. His Overlord Form contains all the above abilities, though to a much more powerful degree. He no longer needs his flames to fly since he has wings, and he has long arms and claws to flay his opponents. He can further distort his body, twisting and stretching his neck and limbs in way ordinary beings cannot. 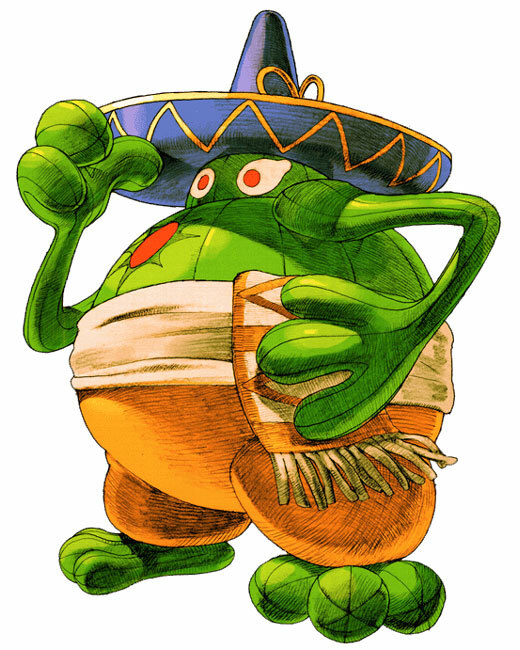 Other abilities in his Overlord form include his "Devil's Eyes" which shoot beams of dark magic at people, and his ability to harness the negative energy into a gigantic magical blast. Syythe doesn't really have any powers of his own, everything he has is standard to his own race for the most part. However, he did learn a bit of magic on his own. That magic being the earring on his right ear. He can unclip it and tossed it towards his opponents, where the cross will then explode into a torrent of dark magic. Oddly, a new earring will appear once the last one is thrown. 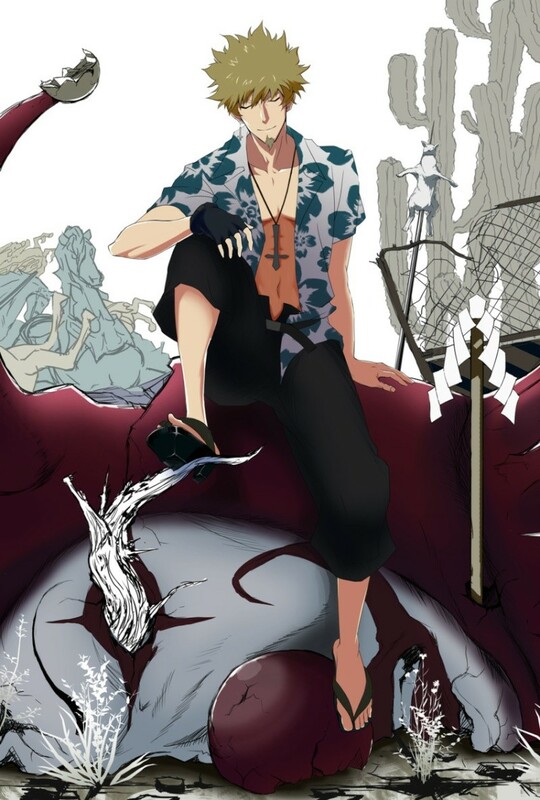 Syythe is actually a well-trained warrior, taught various forms of combat by the dark seers whom watched over him. He's well versed in hand to hand combat and tends to use his skills in these forms of combat to handle enemies in a nonlethal fashion since his powers tend to be very dangerous to use. Syythe is an unfortunately complicated guy, which stems from his rather unfortunate past. He comes off as a leisurely bum at first. He tends to just hang around being lazy, taking naps in public places and never paying for anything. He doesn't appear to have a house, and he often asks for other people to get him food. He comes off as a Class-A loser. In truth, he's quite an elite Hero, whom tends to be very efficient in his Quests. Having no need for material means beyond what entertains him, he simply gives most of his salary away to Love Deluxe or charity. He is very remorseful of all the evil deeds he's done as an Overlord, and he tends to take it horribly when his time as a rather evil world-conquering villain is brought up. He only reveals his true form when absolutely necessary, he's absolutely disgusted with it now. Syythe Xverian is a Tyrant, a being formed from the darkest forces in the universe. Upon his creation, he was destined to bring destruction onto Sol. He was such a danger that even the forces of Hell sought out to kill him. Raised by the Dark Seers, Syythe was taught to become an Overlord, a being that would gather Sol's vile forces of evil together and lead them to triumphant victory over Sol. Once he fully developed as a Tyrant, Syythe took his rightful place as Overlord and began his campaign against Sol. He struck against the Kingdom of Arghast, which to this day is nothing but ruins and fields of corpses. It is said that Syythe would have continued to lay waste to thousands of more kingdoms, until one day he was stopped by The Goddess herself. Not with force, but with words. The legend goes that The Goddess visited him in his quarters, and after a single conversation convinced him to change his ways. So Syythe turned on his own kingdom and the Dark Seers, dismantling all that he had and fleeing whatever was left. Syythe spent many years as a vagrant, now disguised as a human and haunted by his past actions, he began to learn from the people of Sol. While once nothing more than a prideful Overlord, he learned humility and love from those around him. He was content with living the rest of his life in the shadows, until he learned a single undeniable fact: evil exists in this world in many forms. Upon seeing a town attacks by a group of bandits, he stopped them. And then again another village was attacked by another force of evil... he stopped them. Again and again he fought evil until eventually he was approached by a Hero Guild, Love Deluxe. Syythe has been in Love Deluxe for about a century, mostly acting out the role of a bum while not on a quest. Despite his appearance and attitude, he is not to be mistaken for a fool, he is an Ace of Love Deluxe. Tyrant Form Theme - Ride the Fire! Maribel is undead, in fact, she's pretty much unkillable. She can be crushed, cut in half, ripped apart, she'll live through it. Of course, she pretty much has to be sewn back together to be of use after that, as she possesses little regenerative powers. Maribel knows "Skull Snake" magic which allows her to summon skeleton snakes to do her bidding. While alone, they aren't of much use, in hordes they can be quite dangerous. Once destroyed, they are defeated, but Maribel can keep summoning them until she runs out of mana. Maribel possesses little to no training. Maribel is rather young and sheltered. Having just escaped from the land of the dead, she doesn't really have much knowledge of her surroundings. She's rather sociable and bubbly, tends to be immature, and is prone to boredom. It is i fact her boredom that led to her running away from home and becoming a Hero. She just wants to have an adventure to relieve her boring life. Unfortunately, Maribel has little to no regard for life, a trait most people from her realm have. This leads to her often killing indiscriminately without realizing that what she's doing is wrong. 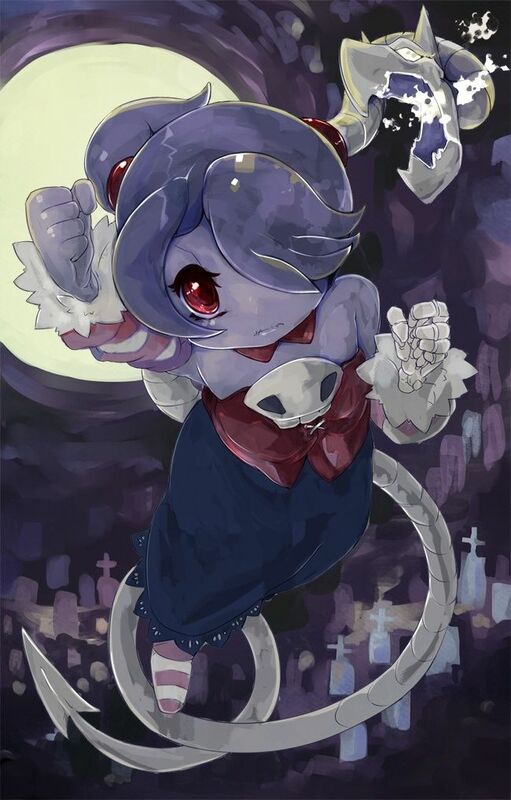 Maribel Muerte is the Princess of the Land of the Dead, and the daughter of Death itself. She was locked up in her chambers in her palace for the last to centuries, with little to do besides read and play games with her servants. She was never happy with her life, often the servants in the castle were too focused on raising her to be a proper lady than actually caring about her feelings. However, Maribel was content, for awhile. That all changed on her 202th birthday. Believing herself to be an adult, Maribel ran away from home and ventured into Sol. Her main concerned was and always will be to have fun, she actually doesn't seem to care much for doing what's right moreso than fulfilling her fantasies as an adventurer. While not actually that trained in combat (Or really at all), her inability to die or really even feel pain have helped her keep up with her fellow Heroes. I would't touch him if I were you...!! Chavo is an experienced brawler, having fought in nearly hundreds of bars all over Sol, there isn't anything he wouldn't bunch in the face. Not just that, but he's been beat up so many times that he knows how to take a hit quite well too! Chavo is a pugnacious fellow, he enjoys a good barroom brawl. He also loves drinking. Really, he's a simple cactus, all he wants is to enjoy his life. And that's exactly what he does to a downright selfish level. Chavo also loves women, and will flirt with them whenever he can. Most of the time it doesn't work because he is a cactus. Yeah. Despite being an alcoholic, brawling, womanizer, Chavo is a hero at heart. Because why beat up normal people when you can be beating up bad guys and rescuing smoking hot princesses?